We take great pride in working on Heritage projects here in Ireland. Our love of the landscape, the richness of the built heritage and the diversity of the flora and fauna of this land are truly inspiring. This appreciation infuses our design work and reinforces the knowledge that these Heritage projects will reach a passionate and proud audience. Click on the links below for more information about our heritage projects. Report on actions taken and promised in support of biodiversity by ten different local autorities crossing the border between Northern Ireland and the Republic of Ireland. 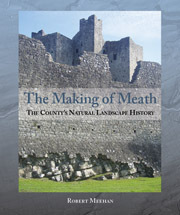 Tells the story of the geology of County Meath in a compelling and accessible format for a general readership. 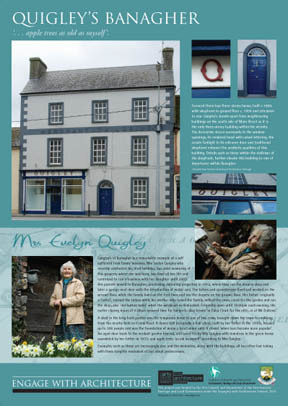 Designed and print-managed for County Meath Heritage Office. Casebound, 210mm x 250mm, 96 pages, full colour throughout. 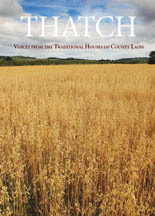 This book celebrates the thatched houses of County Laois and the people who live in and look after them. Designed and printed for the Laois Heritage Office. Featuring many photos by James Fraher. Written by Mary Ann Williams. Original research by Sinéad Hughes and Bronagh Lanigan. Additional photos by Alf Harvey and other sources. Softcover. A4. 64 pages. Full colour throughout. Designed and printed for the Arts, Heritage, Conservation and Planning Sections of Offaly County Council. Designed and printed for the South Tipperary Heritage Office. 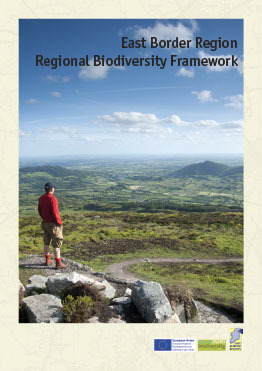 Text compiled and edited by Mieke Muyllaert in association with the South Tipperary Biodiversity Forum. Softcover. A4. 48 pages. Full colour throughout. Celebrates the fascinating flora and fauna of County Mayo, Ireland. Designed and printed for the Mayo Heritage Office. Written by Michael Viney. Hardcover. 18 cm x 24 cm. 100 pages. Full colour throughout. A resource for Primary School teachers to assist them in teaching pupils about the native species in Ireland. Designed and printed for the Meath, Monaghan and Laois Heritage Offices. Written by Éanna Ní Lamhna with illustrations by Christine Warner. Softcover. A4. 68 pages. Full colour throughout. 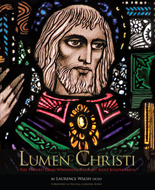 Chronicles the thirty-nine stained glass windows of Mount Saint Joseph Abbey. Designed and print-managed for the Cistercian Press, Mount Saint Joseph Abbey. Written by Laurence Walsh, OCSO. Featuring photographs by Sean Curtin and James Fraher. Hardcover. 9 inches x 12 inches. 256 pages. Full colour throughout. Bookmark ribbon. The story of early monastic sites in County Offaly, Ireland. Designed and print-managed for the Offaly Heritage Office. Written by Caimin O'Brien. Featuring photographs by James Fraher. Hardcover. 9 inches x 12 inches. 244 pages. Full colour throughout. The history and flora and fauna of the Mountmellick Canal. Designed and printed for the Laois Heritage Office. Written by Mary Ann Williams. Softcover. A4. 44 pages. Full colour throughout. Educational materials about the River Suir in South Tipperary. Designed and printed for the South Tipperary County Museum. Folder and inserts. Full colour throughout. A Conservation Plan prepared by Howley Hayes Architects. Designed and printed for the Offaly Heritage Office. Softcover. A4. 90 pages. Full colour throughout.